For the little ones, ages 4-10, Elkhorn Kids Camp is a good way to go. Owner Erin Tippetts has been in the summer camp business for as long as she can remember, first working as a counselor at Elkhorn Kids Camp in 1993. The camp is now in its 19th year and offers a wide variety of outdoor activities such as tennis lessons, figure skating, hiking, fishing and water games. Each session has around 45 kids. The kids are divided into three groups: Seekers, ages 4-5; Explorers, ages 5 and a half to 6; and Masters, 7-10. Days are jam-packed with mountain town activities. One group may start the day fishing at Sun Valley Lake or hiking on Dollar Mountain, then end the day frolicking at the water fountain park in Ketchum or doing magical arts and crafts. "It gives kids everything that Sun Valley has to offer," Tippetts said. Tippetts has three children of her own—Cael, Lily and Shantel. "I just love the children and their energy and their innocence and how everything is new and exciting and fun, and it keeps me young and fun," she said. 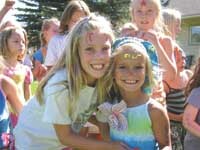 Elkhorn Kids Camp is located at the Gateway Building in Ketchum. The camp runs from June 7 through Aug. 27. It is open from 8 a.m. to 5 p.m., Monday through Friday. Camp hours are 9:30 a.m. to 4 p.m. for a full day, and 9:30 a.m. to 12:30 p.m. or 12:30-4 p.m. for half a day. No additional charge is applied for the hours before 9:30 a.m. or after 4 p.m.
Reservations are required and can be made by contacting Tippetts at 622-2777 or e-mailing elkhornkidscamp@gmail.com. See www.elkhornkidscamp.com for more information.